A Valentine’s Day card appears on your desk, in your email inbox or in your home mail box. What you may not realize is that what you experience from that point on is virtually identical with or equivalent to some of the key stages of recruitment screening. I intend to show that these recruitment stages, in turn, and the sending and receipt of a Valentine card, are governed by principles of well-known information theory dynamics, their simple math, and the psychology and logic of message transmission. - “Tejime“(手締め)–another Japanese custom: specifically, the form ippon-jime (一本締め) defined by clapping one’s hands rapidly in three sets of three rapid claps each (followed by a single clap). I will now argue that in an analogous way, so do the sending of Valentine’s cards and some key steps in the hiring process. But first, an example of what this 3-step rule means: A child and parents in a mall on X-mas Eve hear “Ho!” That grabs their attention—as stage 1: stimulation. They then hear a second “Ho!”: That identifies the source as (a) Santa. That’s stage 2: identification. Finally, they hear the third “Ho!”. That clinches it; it’s (a) Santa! : Bingo! That’s confirmation. Unhappily, the same applies in battlefield trenches: One soldier lights a cigarette (causing stimulation of a sniper attention response); the match unnaturally “floats” horizontally toward the second infantryman: That identifies the light as a match (as opposed to a zig-zagging firefly). Finally and fatally, the match guides the sniper’s aim to the third and unlucky warrior, who becomes a “confirmed” kill. If we look for this pattern in both Valentine’s Day cards and in recruiting, it’s not hard to find, once it is understood. Start with the card: It unexpectedly appears (stimulation); you suspect it’s a Valentine card because of the bright red envelope. You open it and confirm it. The effect and sequencing is even more dramatic, even if less clear when it’s from a “secret” Valentine. Notice that in the case of the card, as in some instances of other signals and messages, the three steps can be collapsed into one when the stages are accelerated, e.g., “Ho, ho, ho!” bellowed in one second flat, allowing no time to perceptually distinguish any stage from the other two. Walking up to someone and abruptly handing over a card while simultaneously saying “This is my Valentine’s card for you” will achieve such a collapse (and spoil both the fun and the magic). But the more tantalizing the 3-step process, through (not overly long) delays between the stages, the more successful the effort is likely to be. 1. A job ad is posted (the stimulation phase that grabs the job seekers’ attention). 3. The job seeker submits a resume and gets a confirmatory email acknowledging receipt that confirms, in the confirmation phase (even if not conclusively) the legitimacy of the ad and the availability of the job). As the title of this article suggests, that’s a “best practices” model, to which, alas, many recruiters neither subscribe nor conform. Now, consider what happens when the third step is omitted. That’s like sending or receiving a Valentine’s card that is never opened. The confirmation stage, being omitted, nullifies, makes suspect or at least confuses the entire process. That’s why HR best practices will/should include that confirmatory step (of acknowledgement) at the beginning of the recruitment process. The same is true on the recruiter message-receipt side: A resume arrives in the email inbox, with a cover letter (stimulation); credentials, work experience, etc., are all presented (identification). But the applicant either omitted contact information, employer and reference contact information, social media links or other crucial details that would confirm the accuracy of the identifying information (failed confirmation). As an overture, that sort of application will flop in precisely the same way as an unopened or unsigned Valentine Day’s card (unless it’s designed to be a tantalizing teaser with planned follow-up—discussed in more detail in connection with recruiting, below). At best, and generally speaking, such truncated sequences and the missing confirmation step create miscommunication and confusion; at worst, alienation and suspicion. The mathematical explanation of the ubiquitous 3-step pattern that I offered in “The 3-Strike Interview Rule” reveals additional dynamics and consequences of its use—in both Valentine’s card transmission and in HR screening. 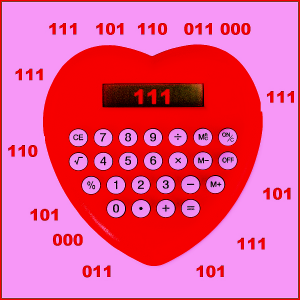 The math is very simple, but powerfully explanatory: Instead of a Valentine card or a job application, all I want to send you is a simple message–”1″, as a binary digit and therefore the only alternative to “0″. If I send it as just a “1″, you will never be sure that it’s correct, assuming (only) a single mistake in transmission is possible. So, I can send it as “11″, with the second “1″ serving to clearly identify the intended message—but not conclusively, since, if there is one error in transmission, you will receive “10″ or “01″ and know only that there is an error, without being to determine which digit is erroneous (given the understanding that the two digits should match and that only one error is even remotely likely). To ensure that a single error in transmission conveys neither a false nor a confusing message, a third digit is added, yielding “111″. Now, if a single zero appears anywhere in the received message, viz., “101″, “011″, “110″, you will know and therefore confirm—by “majority vote”–that the intended message was “111″, which means that the intended message is “1″. This formatting exemplifies what in information theory is called a “parity check”, to ensure reliable transmission and perfectly corresponds to my 3-stage stimulatiion-identification-confirmation model and dynamics. However, what the math adds to the analysis of the Valentine card-HR screening equivalence is an added dimension and scenario to consider: Namely, consolidating all three normally time-based steps into one structurally integrated step. That is, instead of performing the sequence over time through three separate stages, separated by some delay, it is possible to complete all three steps in one message, much as an over-eager, nerdy suitor would by blurting out “This Valentine card from me is for you”. I just said “much as”, not “entirely as”, because in the case of digital transmission, the “111″ sequence is a success, whereas his condensing all three stages into one is very likely to be a social failure—as would some HR screening processes that attempted to do it all in one email or ad, e.g., a job ad that stimulates interest, identifies the applicant and confirms his or her hiring (by declaring “no applicant will be rejected!”). This is not to say that some such replacement of a time-based sequence with a structural integration of all three (analogous to simultaneous transmission of “111″) is not only effective, but also essential—e.g., in making sure that your submitted resume completes all three tasks in a single transmission: to stimulate interest, identify yourself through various claims and confirm them. In general, the last thing you want to do is to break up that integration into three separate and sequenced emails as a kind of misconceived teaser-approach. Yes, classic time-based 3-step sequencing can, on occasion work, depending on just how stimulating the initial phase is. For example, a cover letter that is limited to dazzling, tantalizing bulleted and incomplete nuggets of information, such as “Profiled in Forbes, July 2012″, without a resume, references, etc., with an offer to provide a full, fully identifying and confirming resume (currently “being updated”), might work. That might succeed in virtue of both the intrigue factor and the increased likelihood that at least one email from you will make it past the spam filters or otherwise not get lost or overlooked, while exploiting the first principle of propaganda: “Repeat the message”—or failing that, at least shoot for repeat contact to reinforce awareness of you, your existence and your splendid “package”. So, if you are getting or offering a Valentine’s card or a job (interview), consider the wisdom of your tactical preferences and weigh their costs and benefits: Do you want to or should you make it a time-based 3-stage affair or to consolidate the steps into one structured (information) package or compacted presentation? Be alert to the hazards of an incomplete sequence, especially the dangers of omitting the third step, confirmation and not getting your “message” across. If you fail on that follow-through, what could have led to a kind of “ho, ho, ho!” celebration may instead shrivel into an “uh-oh” moment and pang of angst.